This is my favorite baby gift or 1st birthday gift – a practical way for parents to save a few treasured keepsakes over the years without getting overwhelmed. The key, as with most organizing attempts, is to have a proper place for everything. The main idea is to have a file folder ready for each stage in the child’s life and limiting the things kept to just what fits in the file, so you have one place to store important documents (like immunization records) but also fun stuff like drawing and writing samples, certificates, and annual school photos. Here are step-by-step instructions on making a custom file storage keepsake box for your kids or as a gift. Plastic File Box. I picked up a Sterilite Large Nesting Show-off at Walmart in the storage solutions section for about $6. (Much more expensive on Amazon.) You can order at Walmart.com but only for store pickup). I like the clamp-on lid and handle and it will work for several years. I have already replaced my 3rd grader’s with a Legal/Letter File Box, but no need to store that size until you need it. Hanging File Folders. For my project, a box of 25 is enough. You can get multi-colored file folders at Walmart or other office supply stores. I ordered the jewel-toned file folders from Amazon when I made them for my nieces. I used a table in Microsoft Word with each row 0.6″ high and each column 2″ wide and typed in the file name. I also added a shape on the left side and put a symbol on it to correspond with each label. If you’d like to use these, just copy one of the label designs at the end of this post and paste it into a Word document, then print! Here’s a list of the files and ideas for what to include in each one. Baby Info: footprints and bassinet label from the hospital, birth announcements, etc. Pictures: professional photos/school pictures. Just a few from each year to use for graduation display, etc. Interview: I want to do an “All About Me” interview on their birthday, so I printed 18 of this version so they are all ready to be filled out each year. Kindergarten-Grade 12: report card, special projects or papers, etc. The goal is to limit it to only what FITS in the file. Blank: I added one extra file just for anything else that might pop up as a category according to their interests, like Music, 4-H, etc. 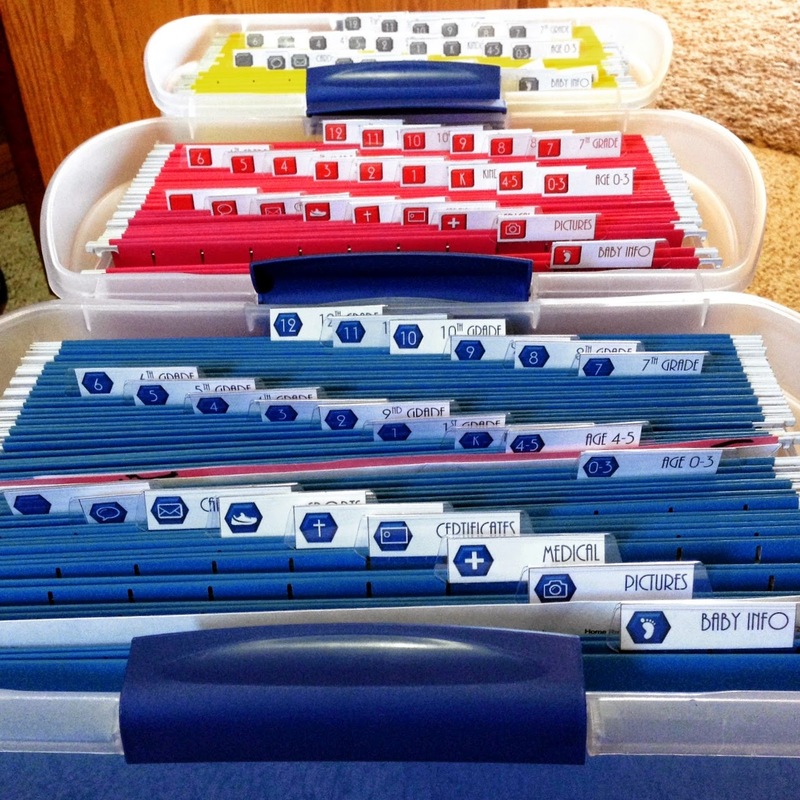 Now, it’s just time to put all the files in the box, add all the folder labels, and fill them! I did my boxes from right to left, one space apart so I could see the symbols. I did my niece’s left to right 2 spaces apart so you could read the whole label. If you’re feeling really crafty, you can add a cute label to the front. I found it better to place them on the inside of the box and stick on with packing tape. Other ideas are to cut out vinyl if you have a Cricut or use paint-pen markers to just write on the front. That’s it! For less than $20 and in just an hour or two, you can be ready to keep your kids organized for the next 18 years! This is also a much-appreciated baby gift! It’s definitely worth putting together while your kids are young and you can modify it to fit your lifestyle. You can keep the files in a filing cabinet, add files as needed, purge things at the end of the year to keep only the most important things, etc. It’s just a system to get you started. Be sure to PIN THIS blog post if this is something you want to come back to later! Follow Working Mom Hacks on facebook for more tips! BONUS: Save any of these label sets as an image, insert into a Word document and print! If you need to check sizes, each cell should be 2″ wide and 0.6″ tall. Best deals of the year at Kohl’s if you have a Kohl’s credit card and know these hacks to doing it right! It’s ONLY GOOD TONIGHT, November 10, 2017! 1) Make sure you’re signed up for ebates. Use this link to get an extra $10! Then sign in to ebates, search for Kohl’s and click “Shop now” next to the 3.0% cash back. 2) Use the window that ebates opened, then Log in to your Kohl’s account and save everything you want to possibly buy to your WISH LIST! Remember, some brands like UA, Nike, adidas and Columbia are excluded from coupons (it will tell you in gray text if an item is excluded). Wish List Tip: If you saved things last night, go to “My Lists” in the footer and you may need to sign-in again on the List window to get to your list. 3) Start adding things to your cart from your Wish List in groups of at least $25, but as close to $25 as possible. 5) Once you place an order, go back to your wish list and add another group of at least $25. Repeat until done! Things do not disappear off your list once purchased, so keep track of what you already ordered. I did at least a dozen orders after midnight last night and paid less than $12 including tax for each order of approx $25-$26 worth of merchandise. It ends at Midnight tonight! We all know Kohl’s has 30% codes every so often and Free Shipping fairly frequently, but the $10 off $25 only comes around on Veteran’s Day, so don’t miss this deal! I shared this on my facebook page, so go to the post and TAG your friends who love a good deal! SHARE this deal with anyone you know who has things to buy at Kohl’s. COMMENT with some of the deals you’re finding. I’ve been a budget-junky ever since my parents made me divide my coins into 3 cups (Give, Save, Spend) when I was a toddler… through my elementary years of writing checks and recording them in a paper ledger (I got a checking account in third grade)… into working years of using Microsoft Money and now YNAB to manage my personal budget. So, it’s probably no surprise that when I decided to jump into starting my own direct-sales business through Rodan + Fields that I would be sure to be on the budget wagon from Day 1. Giving: Obviously a personal choice, but I choose to tithe 10% of my income. I encourage you to find a percentage you’re comfortable with and give it somewhere that is meaningful to you, whether it be to your church, to sponsor a child, to your local food pantry, the R+F Prescription for Change foundation, or even let your customers decide what charities they want their sponsor to support. Taxes: When you get a paycheck from a regular employer, whatever taxes have already been set aside and paid to the government for you, based on your W2 withholding. This is NOT the same for the commission check you receive from RF Pay Day. It’s up to YOU to save money to pay your taxes at the end of the year. Keeping track of business expenses can significantly reduce how much you owe, but my best advice is to discuss with your tax adviser and make a plan. I’m being conservative and setting it aside as I go, hoping to not owe near this much in April and give it back to MYSELF to spend at the end of the year. Fixed Expenses: The optional, but encouraged Pulse website costs $24.95/month and you want to be a month ahead–set aside $25 of this month’s income to pay for next month’s expense. If you’re choosing to pay for your cell phone or internet out of your business income, this is a good place for that too. Variable Expenses: Think about all the costs that pop up each month to help grow your sales: samples, postage, packaging materials, invitations/food/rental for a BBL or consultant event, rebates or sales for your customers, etc. It might take some money to start making money, but you don’t want to overspend on sales and samples, leaving you with no money at the end of the month. Personal Product: To reach 100 SV each month and qualify for commissions, you’ll get 20 QV from Pulse and will need to achieve 80QV in product. This can generally cost over $100 when you add tax and shipping. If you find yourself short in this budget or not in need of personal product, consider doing a bulk sales or ordering for family off your CRP. For instance, sell 2 eye creams or 3 mineral peptides + brush, or 4 Essentials and a lip balm. Try to keep it as close to 80 QV as possible but you need at least 80 QV to reach your “100 bucket”. Profit Income: This is what I personally would feel comfortable “spending” on things outside my R+F business. Use THIS to meet your personal financial goals such as paying down debt, saving for college or retirement, or funding a family vacation. Budgeting is not about limiting your spending, it’s about getting your money to do what you want it to do. This is mostly covered in Step 1 since your monthly expenses are part of your budget, but consider this if you want to buy more personal product than what your budget allows (such as a regimen bundle which saves you $ in the long run, but costs much more than $80). You may need to save up for 2 months to pay for that and find other ways to fill your 100 QV, such as retail sales or selling bulk-order products. I also make myself think about each individual order needing to be a money-maker. You may decide it’s worth it for long-term gain but if you’re just starting out, don’t get caught giving away too much. So, don’t offer a $50 product free on ANY PC order because if someone only spends $80, you’ll be losing money. Don’t offer to reimburse a Preferred Customer’s $19.95 enrollment fee if they buy one time and return it. Don’t offer $100 back on a $695 kit that you only make $90 commission on. Another tip is if you are offering a big incentive, limit it to what you can afford. Don’t offer to give out 5 Eye Creams if you don’t have the cash this month to buy them–you don’t want to get in the habit of borrowing from next month’s potential check. Use only the money you’ve already earned. Math is hard, but being broke is harder. Do the math. This is meant to encourage you to adjust your budget throughout the month if needed. This could happen if you make a retail sale and decide to adjust your personal product sales since you now don’t need as much to reach 100 QV. Or you might decide that a $20 entry fee into a flash sale is a good investment (it was for me) or you want to take some personal profit to buy more samples or pay for postage. Just don’t let your accounts go negative–the borrowed money has to come from somewhere and if it’s not in your R+F budget, it will have to come from your family budget. Under no circumstances do I encourage buying on credit card if you don’t have the funds to pay for it today. Don’t Borrow from your future, make the sacrifice today. Don’t spend money that you THINK you’ll earn this month/receive on PayDay next month. Only spend money you have already earned. For me, this applies to kits too. I used personal savings to pay for my kit (I didn’t float it on a credit card thinking I’d make it back the next month). I did sell several regimens out of my kit right away just to get some cash flow going and invested into next month’s expenses. But if I were trying to pay back a credit card for my kit expenses, I wouldn’t have had much to invest in my business in the beginning. This rule applies to regular paydays too. If I had a great May, I get that paycheck on June 12 and use it to pay for JULY expenses. It obviously takes a little bit to get in this cycle, but at the very least, try to have your June 12 paycheck pay for expenses that occur after June 12 (move your CRP, don’t offer rebates or buy samples until you get paid). Only spend money you’ve already earned and received. Those are YNAB’s 4 Rules that apply to not only personal budgets, but your Rodan + Fields business as well. It works for many other direct sales or small businesses too. Some direct sales companies require you to buy inventory before selling it so your budget will look a little different but the same principles apply. I personally love not having to front money for inventory so I can truly apply last month’s commission to next month’s expenses instead of having to pay off last month’s wholesale purchases. Interested in learning more about You Need a Budget? They have awesome video training, offer a free 34-day trial AND if you sign up using my link, you’ll get one month FREE when you subscribe. Interested in learning more about starting our own Rodan + Fields business? Join my Rodan + Fields Courtney Boone facebook group. *The Rodan + Fields Income used in my illustration was just an example and does not indicate or guarantee your income as an Independent Consultant. Read the full Rodan + Fields Income Disclosure Statement for more details. Please ask questions in the comments or message me through my facebook group! Part of the reason I joined Rodan + Fields was to help others achieve financial independence and financial literacy is one of my passions. I’d love to help you out or hook you up with other budgeting resources! One of my top money tips that involves saving time (and potentially money) is to automate your bill-pay process as much as possible. Most credit card accounts have auto-bill pay options and even many of my bills can ACH directly out of my checking account. If you are living in 1997 and still mail or drop off your bills, this saves you both time and money in postage and gas. It eliminates late fees from bills that get forgotten, lost or confusion over who in the household was supposed to pay it. It frees up mental bandwidth that was previously spent on remembering where the bills are, what is due when, what has gotten paid or not, etc. I include some of my own savings as auto-payments each month, such as funding ROTH IRA and college investments accounts . This way they don’t get de-prioritized as other bills come in. You can also set up automatic drafts to a savings account if you’re saving money there for something special. Check your accounts for all the bills that come in during a month and then set up the auto-pay all at once, otherwise you’ll wonder which ones are on auto-pay and which ones you have to manually pay. Not all of them note on your statement whether auto-pay is on. Put your passwords somewhere safe. If you have irregular bills that come up, set them up for automatic renewal if you know you want to continue use, or use your bank ‘s bill-pay system to avoid using a stamp and envelope. If you’re into credit card rewards, some bills will let you charge your card instead of drafting directly from your checking. For example, I pay my cable/internet bill on my credit card every month, then my credit card automatically pays on it’s due date. Just know that organizations are charged a fee to use credit cards, so I choose not to put my church/non-profit giving on a credit card because I don’t want them to have a to pay a transaction fee. Subscriptions like Netflix, Amazon Prime, ID Theft protection, Computer virus protection, software, etc. If you do have any accounts that don’t allow auto-pay-in-full, at least figure out their online payment system so you can save stamps and trips. For example, if you doctor at a Sanford medical facility, use My Sanford Chart to pay your bills using your HSA debit card. Or at the very least, your bank may have an online bill-pay feature that will send a check for you to any business you set up. I also recommend Paypal as an easy way to send money to friends or family for all those little things like splitting the cost of a gift or a restaurant ticket. Much easier than sending checks that someone has to cash! Just make sure you send it through “Friends and Family” and don’t send them a “request to pay” or a fee will be charged. What other tips or ideas can you share on automating your bill-paying process? There is no comfort food greater ingrained for me than Tater Tot Hot Dish. Here are my Top Tips to make an easy casserole even easier and better. Make 2 at once. If you’re making the mess, just make 2 and freeze one. This is a huge time-saver and sanity-saver when you have meals made and ready to put on your weekly meal plan. Since you’re making 2 at once, brown 2 lbs of meat. I mix 1 lb of ground beef with 1 lb of ground turkey. Ground turkey is generally much less expensive and if you mix them together in a casserole, you can barely tell the difference. If you’re chopping onion to brown with the meat, chop a whole onion and freeze whatever you aren’t using immediately. Cry once, use twice. I freeze in small containers or freezer bags. Mix it up. I made one with cream of mushroom soup and green beans and the other with tomato soup and corn. You can also add shredded cheddar to either variety if it suites your fancy, but I sometimes skip it. I like to use casserole dishes that come with lids so they are easy to freeze and easy to put away into the fridge as leftovers. Remember to write the instructions on a label on top! Buy tater tots (or Crispy Crowns or Golden Rounds or whatevs) when they are at rock-bottom price (below $2 where I live) and stash in your deep freezer until you need them. I bake at 350 degrees for 30 minutes but then BROIL them for a few minutes to crisp up the tots at the end. Same thing for re-heating. I’ll put a portion in an oven-safe dish, microwave it for a minute but then broil it for a minute or two to get the tots crispy. Yum! Freeze other casserole. Thaw 24 hours in fridge before baking. For best results, you should keep the tots off the casserole and keep them frozen in their own bag until baking, but it does work fine if you thaw the casserole with tots. Don’t over think this, it’s tater tot hot dish for goodness’ sake. You shop online anyway, so why not get paid for it! Learn my pro tips for which sites to use and how to maximize your cash back! Here are my top 3 ways to get money back for shopping you were going to do anyway. Why I Love It: When you install the ebates button, it’s easy to remember and simple to earn cash. How-To: Before going to a retailer website, go to ebates.com, search for the store, then click on the link to earn CASH BACK on your purchases. You MUST use the window that pops up with the store’s site in it to get credit! The % cash back varies by store and by time. There are also usually some stores on Double Cash Back and they have great Black Friday and Cyber Monday deals. Pro Tip: Add the ebates button to your Chrome browser and it will remind you anytime you’re on a site that has cash back to activate Ebates! It will also show up in your search results. What you earn: Straight % rebate based on what the listed rebate was at the time of purchase. So, if you click the link to get 6% back at Kohl’s and spend $100, you’ll get $6. Payment: Big Fat Check* (that’s what they call it) sent by mail every quarter, no minimum for payout. Sign-up Bonus: Use my link to get $10 free if you’re a new member! Referral Program: Changes every quarter and there is usually bonus for your friend, bonus for you! Click on “Refer + Earn” for details. Why I Love It: It sometimes has higher rebates than ebates and I can earn even more when I cash out for Amazon.com gift cards. How-To: Before going to a retailer website, go to topcashback.com, search for the store, then click on the link to earn CASH BACK on your purchases. You MUST use the window that pops up with the store’s site in it to get credit! The % cash back varies by store and changes often. You can only go “through” ONE site to get to the retailer site, so you can never stack ebates AND topcashback. Pro Tip: Before shopping check both ebates and topcashback and then go to the store site through the one with the higher rebate % listed. What you earn: Straight % rebate based on what the listed rebate was at the time of purchase. So, if you click the link to get 10% back at Under Armour and spend $100, you’ll get $10. Payment: ACH to your bank account, PayPal or get a bonus when cashing out for an American Express Rewards card, or Amazon.com gift card. Cash out* anytime with no minimum. Referral program: Refer your friends to get $10. Click on “Tell-a-Friend” and then share your link. Why I love it: You can earn money back for buying gift cards (ebates and topcashback exclude gift card purchases) plus you can grow your earnings by a referral network. How-To: Sign up for a free account at Trunited using this link. Click on “National Brands” to do online shopping through stores (similar to ebates or topcashback) or go to “Gift Card Shop” to buy gift cards. Each will tell you the % of Profit Points you’ll earn for the purchase. You can also put items or gift cards in your “TruBox” for auto-shipment every month with free shipping on $100+ and get 10% more profit points. What you earn: A % of your purchase is earned as “profit points”. At the end of the month, the profits of all sales are distributed back to all members. Profits are the sales minus the cost of goods/gift cards (the site negotiates for a discounted rate). Your cut is determined by the number of profit points you earned that month. The more sales overall, the bigger the pool. The more profit points you have, the bigger your cut. Payment: Once per month, you are paid into your truWallet which you can then use to buy goods or gift cards next month, or you can cash out*. Referral program: Earn more points by referring friends and reaching milestone levels such as “PaceSetter” which is inviting 3 friends who invite 2 who invite 1 and all make a purchase that month. You will earn on purchases of friends-of-friends instead of just the people you directly refer. Click My Account, then My truDashboard, then Refer Friends and customize and share your link. Disclaimer: There may be a fee to participate in the affiliate part of this program (earning on friends of friends) but you can join free as a member and earn from the profit pool based on just your purchases. The affiliate portion is subject to change, but you do not need to pay a fee until you know what payment you would be eligible for as an affiliate. *You should consult with your tax adviser on how to report income earned in the form of gift cards or cash back. Those are my TOP 3 ways to earn money while shopping online. There are many other ways to find COUPONS (Retailmenot.com is my favorite) but all of those coupon codes can be STACKED with any of these sites. You can even buy a gift card off Trunited, then go through ebates OR topcashback, then use a coupon code (and a Target Redcard discount…) and double-, triple-, even quadruple-dip! Sign up for Trunited and buy digital gift cards online. Shop through Trunited, ebates or topcashback to get to a retailer site. Pay with your digital gift card. EARN MONEY for shopping online! I was recently asked by an old friend for advice on budgeting. She had seen my post on another friend’s page suggesting the budgeting tools I liked and asked what advice I would give for someone who wanted to start spending their money more intentionally. So, I’d like you to look at this as me answering that question, as if we were sitting down together over coffee. I’ll give some un-expert, but tried and true advice, and even sprinkle in some of our story. What is your end-goal? It’s important to personalize this because it’s going to affect the choices you make and how you prioritize different than someone else. Here are some ideas to get you started. I want to stop living pay-check to pay-check or juggling bills to stay ahead. I want to stop fighting with my spouse about money. I want my kids to go to college and not have as much debt as I did. Get a real picture of your debt. Write down EVERYTHING you owe with total balances, monthly minimums, due dates, and interest rates. This includes mortgage, student loans, vehicle loans, toy loans, credit cards, personal loans, family loans…you get the picture. Log into all those loan sites (and save the passwords somewhere). You will never be able to decide where your money gets to go until you know where it HAS to go. If you want to use paper, that’s fine. If you like technology, I’ve heard good things about undebt.it or readyforzero.com. OUR STORY: When we first took Financial Peace University, I thought we were in GREAT financial shape. We budgeted, saved for retirement, paid our credit card off every month, and were saving for grad school. It was a reality check to write down that we still had a 30-year mortgage, a vehicle loan and various student loans several years after graduation. Next, commit to no new debt and getting out of debt. No car loan. No second mortgage for a remodel. No student loans. No more credit cards if you have any with balances. It’s important to write this down and commit to it as a couple so that the “I NEED a new [car/whatever it is]–we can always finance it.” discussion is off the table. OUR STORY: We decided there was no reason we should be paying interest on a vehicle loan when we had enough in savings to pay off the truck. We also committed to driving our current vehicles until we could save up cash for the next (used) purchase. We committed to doing everything we could to pay off our student loans within 2 years and that we would have grad school paid off by the time my husband completed his Master’s degree in the next 2 years. Seems easy for people like us who get paid once or twice/month, but really look at every source of income: salaries, bonuses, overtime, side jobs, interest earned, etc. If you have variable pay, write down your income for the past year to get a good idea of where your peaks and valleys are. OUR STORY: We had steady salaried jobs but wanted to make sure any extra income or bonuses wasn’t frittered away. We pre-committed any extra money to be used for whatever goal/baby step we were on at the time. Made bonuses a lot less exciting, but made our goals possible. List your yearly bills (monthly x 12 plus any annual payments like car/life insurance, subscriptions, etc.) and expenses. If you don’t know where to get started, your checking account register online is a good start. It’s recommended to comb through 3-6 months of expenses and start categorizing them. You’ll need a good picture of where you money is actually going before you can make a realistic budget. Get an emergency fund or buffer. Dave Ramsey suggests a $1000 emergency fund, YNAB suggests “buffering” one month of expenses (use September’s paycheck to pay October’s bills). The idea is that you don’t want to create new debt/an emergency if an unexpected expense shows up. So, set aside some money from the beginning that is only for emergencies. You might already have that in savings, you might need to pick up extra hours or a side job or sell some things. But you want to do it fast, even if it’s not fun in the short run. Make a plan: Get that first Budget done. OUR STORY: After YEARS of budgeting, here is a list of my categories. You have to merge/separate what makes sense for you, but sometimes it helps to see someone else’s list to help trigger ideas of things you may forget about. Whether you use a debt snowball, a debt avalanche, fancy software or just a pen-and-marker thermometer, you need to make a plan on how/when you are going to get all of your debt (except your house) paid off. Quickly. Like 24 months or less. What can you cut out of your budget? Where can you make or commit and extra income? What can you “pause” until it’s paid off (retirement, college savings, new vehicle saving, down payment). Getting out of debt is one of the first keys to freedom. Well, I think that’s plenty long for a “getting started” post…I told you brevity was not my strong suit. I may elaborate more on the budgeting and debt repayment sections in the future, but there are so many routes you can take and I truly believe you have to do what motivates YOU most, not exactly what I did. If you have any comments or questions, I’d love to follow up with you!